Bucchero (Kantharos) wins the Woodford (G2) at Keeneland on 10.06.2018. Fernando De La Cruz up, Tim Glyshaw trainer, Ironhorse Racing Stable owner. Bucchero (Kantharos–Meetmeontime, by General Meeting), whose 11 career victories included back-to-back victories in the Grade 2 Woodford Stakes at Keeneland, and who will enter stud at Pleasant Acres Stallions in Florida in 2019, will be available for inspection to those attending the November sales this Sunday, Nov. 11, from 3-5 p.m. at KESMARC Kentucky, located about five minutes west of the racetrack at 258 Shannon Run Road in Versailles. The first son to stud for the young and very promising Kantharos, Bucchero ran a ThoroGraph 4 to break his maiden at second asking and was a four-time stakes winner in Indiana-bred company before breaking through with a 1 3/4-length defeat of a field that included former G1 Breeders' Cup Turf Sprint winner Mongolian Saturday in the 2017 Woodford. He carried his top form into his 6-year-old season, with placings in Keeneland's G2 Shakertown Stakes and the G3 Turf Sprint Stakes before accepting an invitation to the G1 King's Stand S. at Royal Ascot. A gallant fifth, beaten under five lengths, in that world-class event, he returned for a fall campaign that included a popular repeat success in the Woodford, earning a return trip to the Breeders' Cup in the process. During his career, Bucchero defeated 24 different graded stakes winners, including champion and $7.5-million seller Lady Aurelia on two separate occasions. 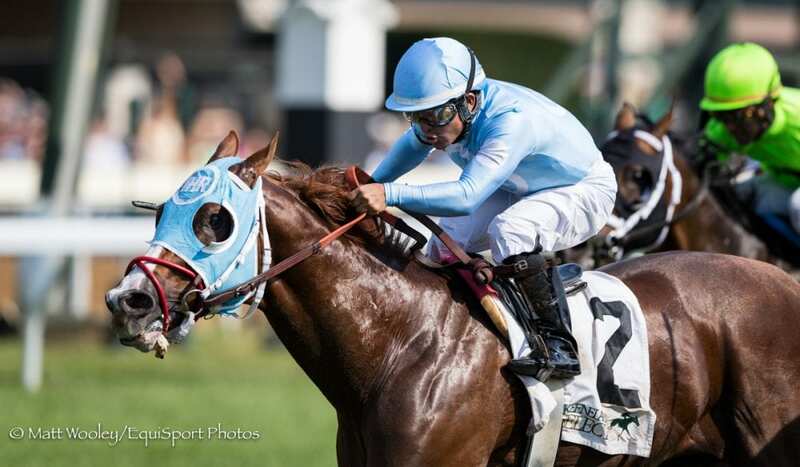 Bucchero retired as the leading Indiana-bred earner in history and bankrolled in excess of $947,000, with seven black-type victories from 5 1/2 furlongs to a mile and a sixteenth. His close relative World of Trouble, also by Kantharos and out of a half-sister to Bucchero, earned a towering 118 Beyer Speed figure in just missing to Stormy Liberal in last weekend's Turf Sprint at Churchill Downs. The stallion show is open to the public and those in attendance will be entered into a drawing to win a free season to Bucchero for 2019. This entry was posted in Bloodstock and tagged bucchero, kesmarc, Pleasant Acres Stallions, Stallion Shows by Press Release. Bookmark the permalink.